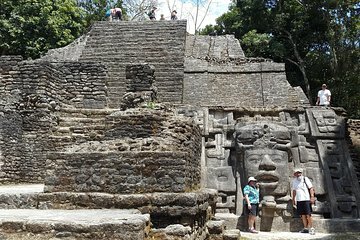 Descubre lo que convierte a Lamanai en una de las ruinas mayas más impresionantes de Belice en este tour de un día completo que te lleva a través de una antigua ciudad excavada que surge misteriosamente fuera de la selva. Busque la vida silvestre nativa que incluye aves y cocodrilos en un crucero por el río al sitio arqueológico, donde las ruinas de los templos de Jaguar y Máscaras y los antiguos palacios mayas exigen la exploración. Vea artefactos fascinantes como ollas de barro y tallas de templos en el museo del lugar, y termine el día con un almuerzo típico de Belice en un restaurante. Incluye recogida y traslado desde los hoteles de la ciudad de Belice o el puerto de cruceros. I cannot say enough about this wonderful and well planned out tour! From the very beginning ,when our driver picked us up at our hotel and took us through Belize City ,giving us a brief history of the areas we passed spots along the way and pointing out exotic birds up in the trees , We knew this was going to be a special day. The boat ride up the new Belize river was exciting and informational. Our guide was terrific and made sure we saw every sight along the river. He had also brought along a bird expert who pointed out native birds in their natural habitats. When we got to the ruins, our guide, who had also been our boat captain ,was extremely knowledgeable about the entire area. He was part Mayan and was very proud of his heritage. After visiting a couple of the temples, we were served a delicious homemade lunch of stewed chicken, fried plantain, salad, and drinks. After lunch, we toured a couple more of the ruins and then loaded back on the boat for the trip back to Belize city. Probably the best tour I've ever experienced! We loved our day! Taxi pick up from the water taxi terminal was easy. Our river guide Carlos was fantastic. Super informative. It was the perfect mix of river ruins and hiking. Excellent trip. This was a fun and adventurous tour. We had Nate as our tour guide! He is wonderful! Thank you for a memorable day. This was a fabulous tour. Alberto was our tour guide for the river boat and the ruins tour...he was great. Lunch was also fantastic! We would highly recommend this.